Zoetry Casa del Mar Los Cabos, Mexico 5.0 out of 5 based on ratings. 1 user reviews. 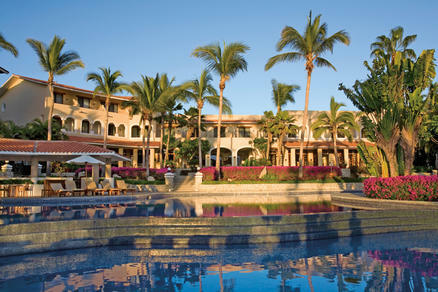 Zoetry Casa del Mar is a 42-suite hacienda-style beachfront boutique hotel, situated in a stunning landscape where the desert meets the white sand and turquoise waters of the Sea of Cortez. Graceful arches, cobbled courtyards, tiled fountains, lush tropical gardens, four swimming pools and authentic Mexican hacienda architecture create a totally romantic atmosphere where Endless Privileges™ abound. Set between the desert and the sea, Zoetry Casa del Mar Los Cabos delivers a taste of old-world Mexico in a hacienda-styled resort with stunning views over the Sea of Cortez. Expect Mexican haute-cuisine, white sandy beaches, a top-notch spa and Cabo Real - one of the world’s best-loved and challenging golf courses. Terraces, views, antiques, Mexican artworks and luscious fabrics give every suite a special feel. The public areas are friendly and relaxed and the whole resort has an ambience of "go-at-your-own-pace" fun. There wasn't one moment of our honeymoon that did not exceed our expectations.